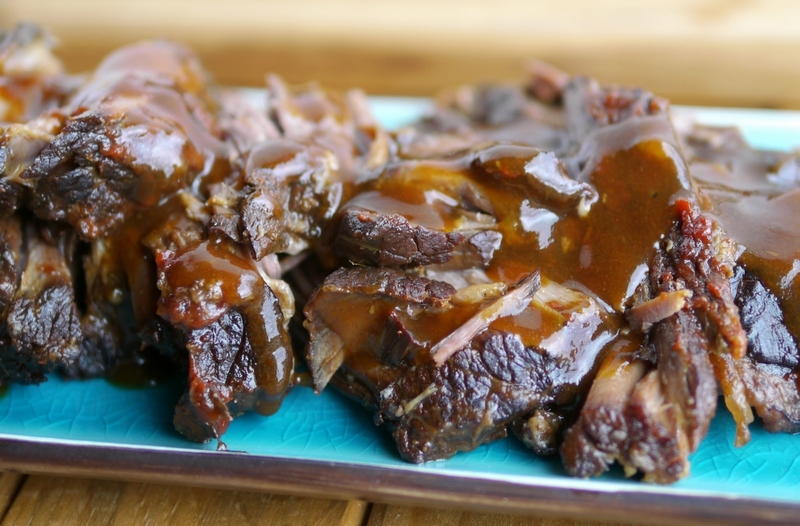 The Best Tasting Slow Cooker Tangy Brisket will become a family favorite for years to come. The fork-tender, melt in your mouth meat and mouthwatering sauce are a true example of what brisket is supposed to taste like. Let me know how you like it. So let’s face it, I’ve shamelessly burned and ruined more pieces of meat than I would like to recall. However, at one point I had to figure out what I was doing wrong. 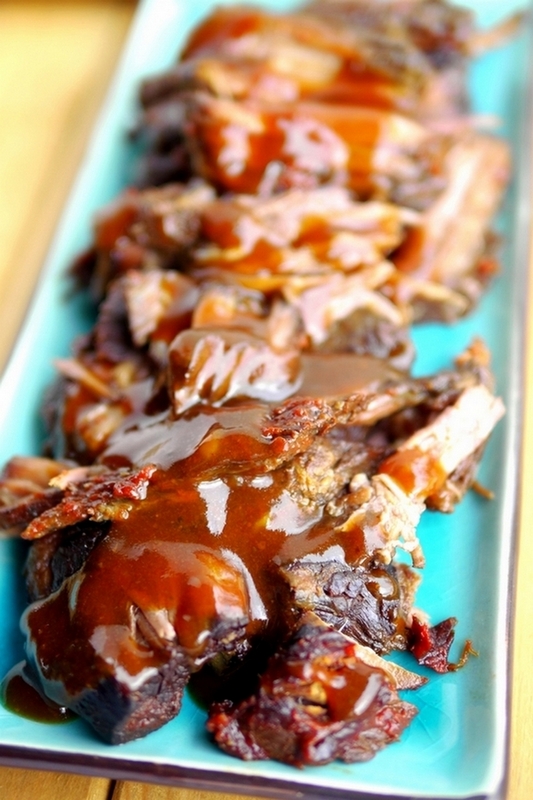 It turns out I was doing SO many things upside down and backwards in the kitchen, but that’s how you learn and that’s how I learned to make The Best Tasting Slow Cooker Tangy Brisket. One of my biggest mistakes was thinking I could cook brisket quickly in the oven. You cannot. Unless you want a piece of leather to chew on. Low and slow is the only way to achieve fork-tender brisket. I’ve also had great success with my Slow Cooker Creole Style Brisket and my Dr. Pepper Brisket-Brie Tacos. However, if complexity is what you crave, I would give this Guinness Braised Brisket a chance too. No matter what you’ve heard THIS IS THE BEST BRISKET EVER! I’m not kidding. It’s super tangy, smoky and moist. This meal can feed a crowd with minimal work and dollars spent. Everyone you make this for will fall in love with you almost instantly; worshiping the ground you walk on. You’ll see, they will want seconds, thirds even fourths, no joke. Even if you have had no success in the kitchen, this will be your new signature dish. I promise, promise, promise. Make sure to place your brisket fat side up in the slow cooker. This way the fat melts over the meat and breaks down the tough connective tissue. Mix up the sauce in a separate bowl before pouring over the meat. This is what the meat will look like when it comes out of the slow cooker. Pour the sauce right over the top and serve. It’s so, so good. This recipe makes great brisket sandwiches too. All you need is your favorite rolls to make it happen. Don’t you want this on your dinner table tonight? 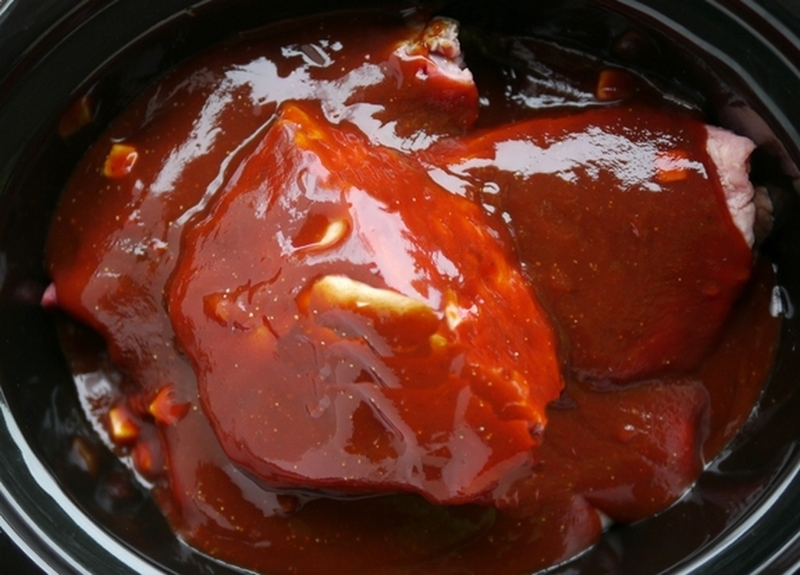 Beef in the slow cooker is one of my favorite ways to prepare a meal. 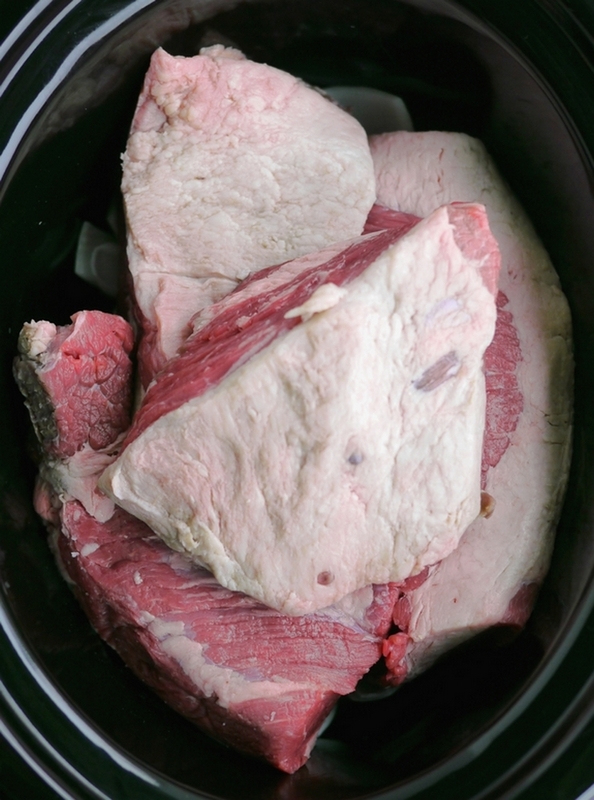 This Crock Pot Beef Burgundy is a great alternative to brisket. 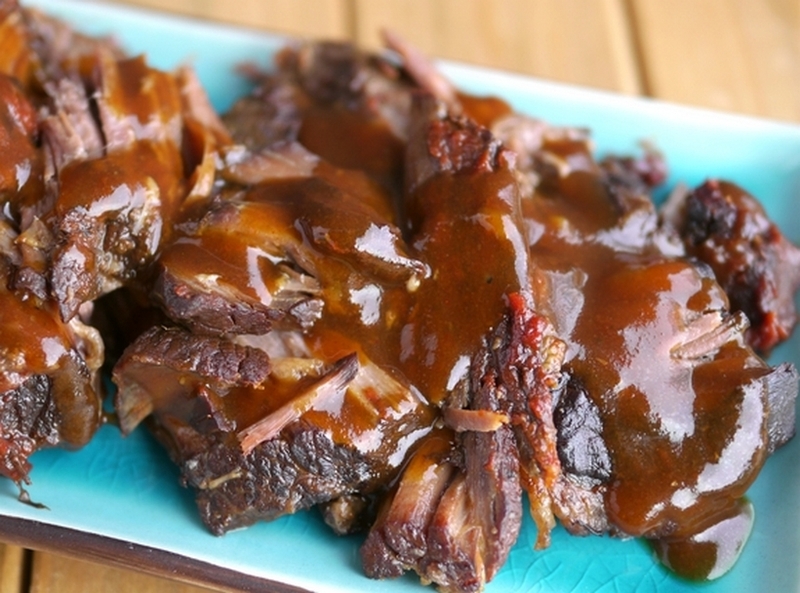 Slow Cooker Beef Tips and gravy also looks incredible. And who wouldn’t want to sit down to dinner and have this Slow Cooker Beef Stroganoff show up. I love making sandwiches with Slow Cooker Italian Beef. And Slow Cooker Beef and Vegetable Soup is made year round at my house. 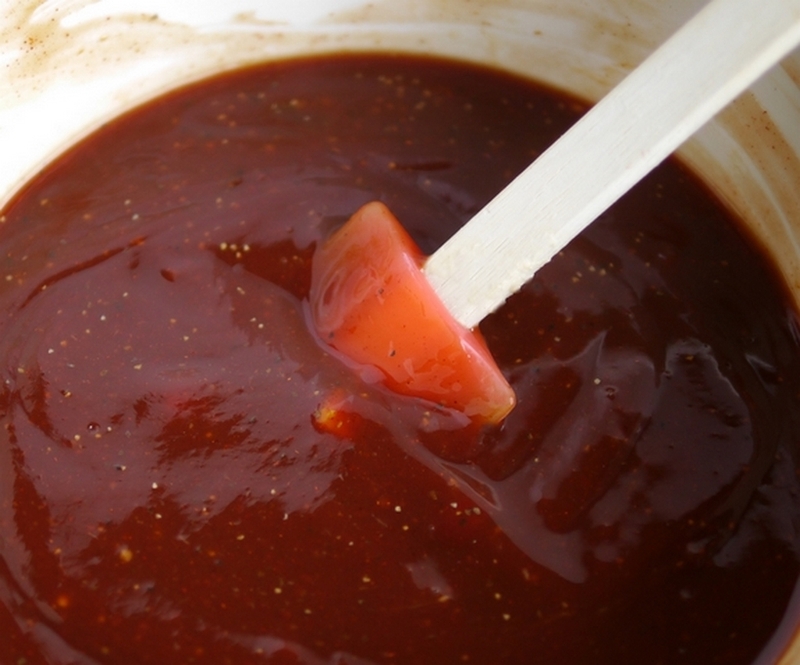 In a medium-sized bowl, combine ketchup, brown sugar, Worcestershire, vinegar, lemon juice, butter, chili powder, hot sauce, horseradish, liquid smoke, garlic powder, salt and pepper. Mix together until all ingredients are fully combined. Pour sauce over the top of the meat into the slow cooker bowl. Cover and cook over low heat for 10 hours. When done, remove meat and place in a pan covered with foil (to keep meat warm), leaving large chunks together. Pour sauce out of slow cooker bowl and through a fine sieve into another bowl (I used a large (8 cup) glass measuring bowl). Wait 10 minutes, letting fat rise to the top so you can easily remove. Once the fat on top is removed, pour sauce into a saucepan and bring to a boil. Mix together cornstarch and water in a small bowl and slowly whisk the liquid cornstarch into the boiling sauce. Continue whisking for one minute and remove sauce from heat. 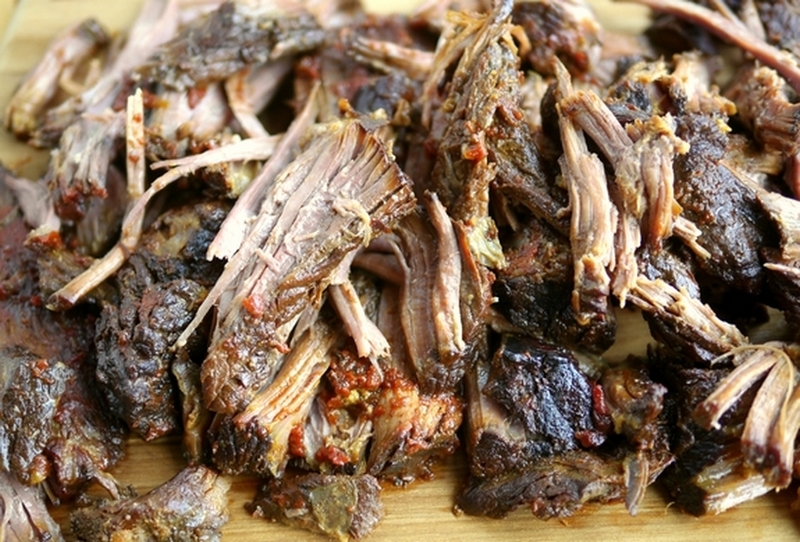 Pull brisket meat apart with two forks, discarding all fat. 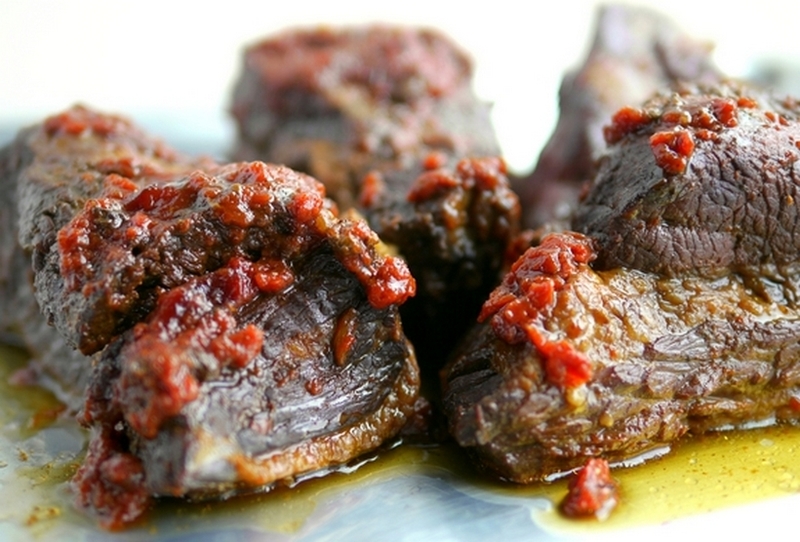 Place meat on a serving platter and pour sauce over meat or serve sauce on the side. Makes great brisket sandwiches too! Note: Bring your meat closer to room temperature before cooking. If you start the slow cooker with really cold meat you might need to add two hours to your cooking time. If you are lucky enough to have extra sauce after the meat is gone, use it as a base for chili the next day...it's fabulous. « Hooray for 100 Days of School! thanks for your nice comment on my valentine’s post. I have to tell you that I’m reading this at 6:50 am and my mouth is watering — I’m literally drooling all over the keyboard. Yum! OH MY GOSH CATHY!! I’m bedazzled by your photographic and journaling skills….I’m sold, and have already put your site in my favorites. Thanks for the laughs and recipe! Will you be doing this weekly? Any ideas for Easter dinner? If you don’t want to cry while chopping onions, hold a wooden matchstick between your teeth — match head out. My mom lights it, puts it out and then holds it in her teeth, but that is a little strong for me… an unlit match works just as well. WOW. Another winner. Looks great. The only thing I would add about this & other cuts of the sort id the importance of slicing the meat against the grain. The whole thing can be easily ruined (or at least hurt) bu cutting with the grain – leading to overly chewy slices. You can but big old 6 pound briskets in Texas, but they are not as lean as the ones you used. I’m trying your recipe this summer. Looks delish! What a great recipe – When I was a kid my Mom made Brisket very similar to the recipe above but her secret ingrediant was a can of beer. Added great flavor. Litterally ran out to the staore, and now have my brisket in the oven. Can not wait to try the finished product…couldn’t help myself had to taste the sauce and almost fainted from the sheer perfection of sweet/spicy goodness. Thank you for the MOST excellent recipe. Thank you so much for your site. Right now I can smell the brisket cooking and we are 20 min away from eating time. This is my first attempt on your site and with a brisket. I want to thank you fir helping me to be brave in the kitchen. Keep it up I will be coming back for more!! I will let you know how it turns out. OMG!! I just read this today and I am going to make this. It looks fabulous and so simple. I have to tell you though, I can’t remember seeing brisket at the store. I am wondering if I am going to have a hard time finding a piece. YUMMY!! I just wanted to let you know that I made this recipe a few weeks ago and it was fantastic! You can see it on my blog. I just love this site, and Cathys personality is as sweet as the food! I spent 3 hrs straight giggling over her comments, and saving recipes to do for my family. I saved a photo to go with each recipe in notepad in the same file with the same name so when you choose what you want to make the pic shows up beside the recipe. It’s wonderful, and I can’t wait to do the, umm, well lets say “all” of them! HUGGLES TO CATHY! I can usually find whole 12-15lb briskets at Walmart that are in their original Excel meat package. I put those big boys on the smoker though. I have been studying recipes and searching for new recipes for over 30 years and I absolutely love this site and your recipes are all awesome! Never have seen a better place to find outstanding recipes. 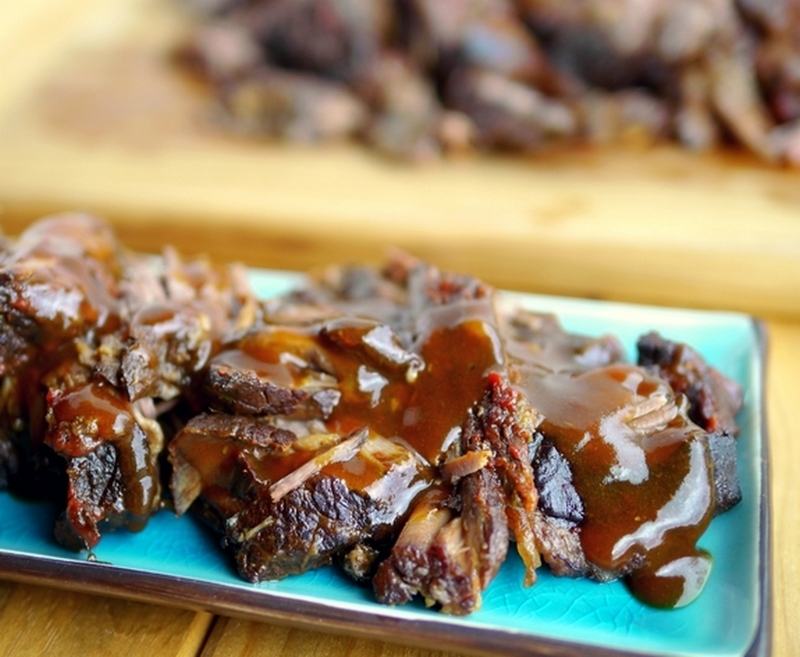 This brisket recipe is absolutely to die for. I have never posted a comment before on any recipe site but I just had to after making this brisket and reading your comments. Your humor is laugh-out-loud funny. Thank you so much. I misread the recipe and added the water and cornstarch to the sauce mixture before I poured it onto the meat. Will this have any major effect on how the meal turns out? Should I still boil the sauce in a separate sauce pan after the meat is finished cooking? I can’t believe I’ve never made brisket before! This looks like a real winner!